For many people, the best time to visit Ethiopia is during the dry season, which runs from October through February. There are exceptions to this rule, however—especially if you're interested in experiencing Ethiopia's cultural festivals, some of which are held during the rainy season. If you're on a budget, traveling during the low season is also a good way to save money. Although Ethiopia's climate varies greatly depending on the region you're planning on visiting, the wet season generally lasts from June to September, with light rains beginning as early as March. June and July are the wettest months, particularly in the Northern Highlands. Weatherwise, therefore, the best time to travel is from October to February, when the climate is both dry and sunny. At this time of year, nighttime temperatures can drop dramatically, so it's important to pack plenty of layers. If you're planning on heading south to the Omo Valley, you need to be aware that there are two distinct rainy seasons in this region. The October to February dry season is the best time to plan a trip to the ancient rock-cut churches of Ethiopia's stunning Northern Highlands. However, even during the wet season, rains rarely last all day. If you're looking to save money, consider booking a trip in March or April, when the rains are light and prices for accommodation and tours are generally lower. Usually, it's best to avoid traveling in June and July, when the rains in this region are at their most extreme. The Simien Mountains are a vast mountain range whose highest peak stands at 14,901 feet, making it one of the highest mountains in Africa. Trekking here is fantastic, not only because of the scenery, gorges, and streams but also because you get a chance to look for endemic wildlife like the gelada baboon and the walia ibex. The best time to trek is from September to November, when it's dry, green, and relatively dust-free. October, in particular, can be spectacular because this is when the mountain wildflowers are in full bloom. 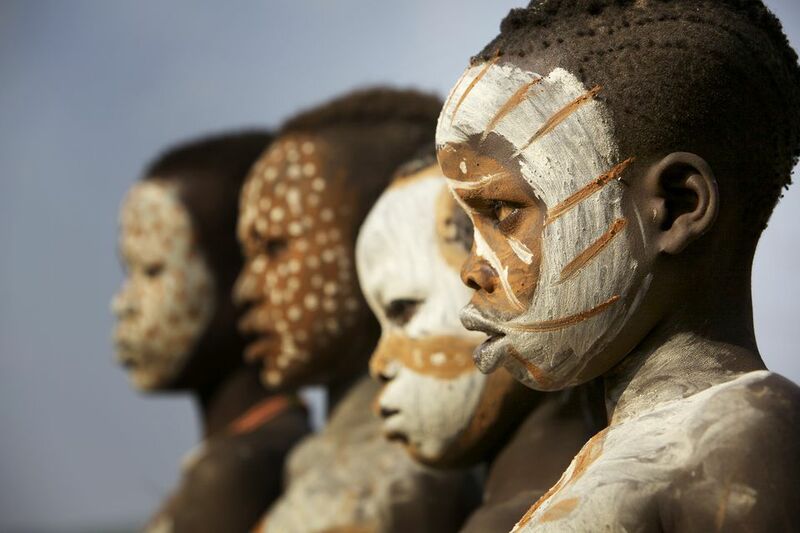 With more than 50 tribes living in the Omo River region of southwestern Ethiopia, it's a fascinating destination for those interested in African culture. The remote location, which is barely accessible by four-wheel drive, means that traditional customs and beliefs are very much intact for most of these tribes. This region has two rainy seasons, with one lasting from March to June, and a shorter one in November. Access is often impossible during these times, so planning your trip for the dry season is essential. Danakil is one of the hottest places on earth, with daytime temperatures easily reaching 122 degrees Fahrenheit. It's a fascinating destination where you can witness the age-old tradition of salt caravans, experience Afar culture, and marvel at a myriad of active volcanoes. If you've ever felt the urge to visit another planet, you'll love the extraordinary landscapes of this region. To avoid feeling like you're boiling alive, however, make sure to visit during the cooler months of November to March. Ethiopian festivals are certainly worth planning a trip around. Mostly religious, festivals generally last several days. Orthodox Christian festivals are the most prominent and visible in Ethiopia and are celebrated according to the Ethiopian calendar. For example, Ethiopian Christmas (known as Ganna) is celebrated on January 7, rather than December 25. Enkutatash, the Ethiopian New Year, is celebrated on September 11. If you're keen to experience Ethiopian festivities at their most colorful, consider planning your trip around Meskel or Timket, but be prepared to book your domestic flights and hotels well in advance. Timket, the Feast of Epiphany held on January 19, is Ethiopia's biggest festival, celebrating the baptism of Jesus. The festival lasts for three days, and includes a procession of the church's tabot, or consecrated replica of the Arc of the Covenant; and ritual re-enactments of the baptism. When the more solemn aspects of the festival are over, participants enjoy feasting, music, and dancing. The best places to enjoy the festival are Gondar, Lalibela, and Addis Ababa. It is worth joining a tour, just to make sure that you are able to reserve accommodation. It's also good to have a guide who can tell you exactly what is going on during the processions. Later in the year, the country celebrates Meskel on September 27. Meskel is an old Christian festival that has been celebrated in Ethiopia for over 1,600 years. It commemorates the discovery of the cross upon which Jesus was crucified. Some pieces of the cross are thought to have been brought to Ethiopia. The best place to celebrate the festival is in Addis Ababa's Meskel Square, where a colorful procession of priests, deacons, and choir singers walk around a huge pyre, bearing ceremonial crosses and wooden torches decorated with olive leaves. The torch-bearers set the pyre alight, and the next day people go to the bonfire and use the ash to make the sign of the cross on their foreheads before spending the rest of the day feasting. Ethiopia's spring is sometimes known as the harvest season and spans from September through November. Belg, as it's called, also kicks off the country's dry period, making it a great time to visit. Enkutatash, or New Year's Day, takes place every year on September 11. Meskel, or Finding of the True Cross, is celebrated on September 27. This festival is among the country's largest, celebrated with a huge procession of priests, deacons, and choirs. Kiremt is the summer season, which runs from June through August. These months are punctuated by heavy, intense rainfall at times. Islamic holidays, such as Eid al-Fitr and Eid al-Adah, usually fall during the summer months. Tseday is the name of the season that runs from March through May, and what most would consider fall. There are occasional showers, and May is usually the hottest month in Ethiopia. Adwa Victory Day is held in early March, commemorating a battle fought between the Ethiopian empire and Italy. Ethiopia's national day is called Derg Downfall Day and takes place on May 28. December through February constitute winter, or bega, in Ethiopia. These months are very dry and it's not uncommon for mornings to be frosty. Ethiopian Christmas is a huge celebration which always takes place on January 7.